There is always a healthy turnout for club sessions. It’s a great way to meet other members, play some good doubles and generally enjoy life at the club. Do come along, Dave the coach will be on hand to mix you. You can play for as long or as short a time as you like - just drop in at any time during the session. During club afternoon, full members take priority over 5 courts. Only courts 6 & 7 can be booked during club times. If there are members waiting, one short set (i.e. best of eleven games) is played then those waiting are invited to join in. No more than one set is played with the same combination of players, unless no other members are available to vary the combination. 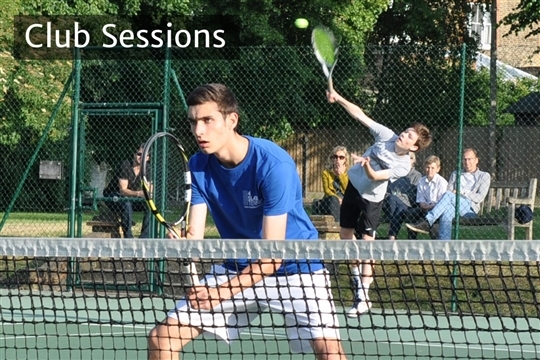 Everyone is welcome to play during Club sessions, provided they have reached a standard sufficient to play a good doubles match. If you are unsure of whether you should come to the session, please contact Charles Morris, who will be pleased to advise whether you have reached the required standard or whether more coaching is needed.